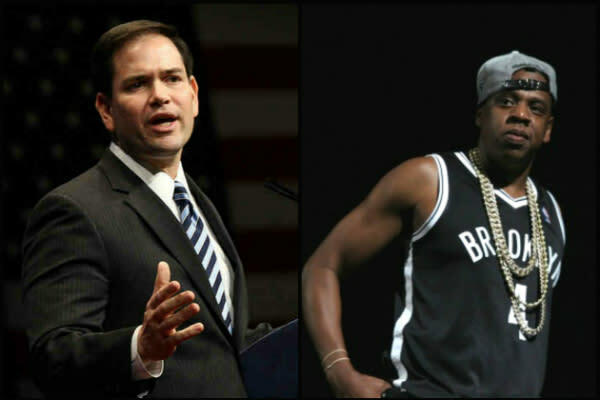 Florida Sen. Marco Rubio has weighed in on Jay-Z's controversial trip to Cuba, saying the rapper-turned-mogul and fledgling sports agent needs to educate himself about the island's oppressive regime. "First of all, I think Jay-Z needs to get informed," Rubio said on “This Week with George Stephanopoulos" on Sunday. "One of his heroes is Che Guevara. Che Guevara was a racist. Che Guevara was a racist that wrote extensively about the superiority of white Europeans over people of African descent, so he should inform himself on the guy that he’s propping up." If Jay-Z "was truly interested in the true state of affairs in Cuba," Rubio continued, "he would have met people that are being oppressed," including Cuban rapper Angel Yunier Remon Arzuaga, a hip-hop artist in Cuba "who is right now being oppressed and persecuted and is undergoing a hunger strike because of his political lyrics. "I think he missed an opportunity, the Republican senator added. "But that’s Jay-Z’s issue." Jay-Z and his wife, Beyoncé, toured Cuba earlier this month on their fifth anniversary. Last week, a pair of Florida Congressmen wrote a letter to the Treasury Department demanding to know whether the trip fell afoul of Cold War-era restrictions on Americans' travel to Cuba. The Treasury Department assured the lawmakers the trip was "educational" and authorized by the State Department's Office of Foreign Assets Control, which enforces sanctions against Cuba. "The bigger point is the travel policies," Rubio said. "The travel policies need to be tightened because they are being abused. These are tourist trips, and what they’re doing is providing hard currency and funding so that a tyrannical regime can maintain its grip on the island of Cuba. And I think that’s wrong." Rubio repeated his attack on H.O.V.A. on "Meet The Press." "I thought it was hypocritical for Jay-Z and Beyoncé to go down to Cuba," Rubio said. "You know, Jay-Z's a guy that wears the Che Guevara t-shirt and he doesn't realize Che Guevara was a racist. Che Guevara was a murderer and a killer." He added: "The fundamental problem is that these trips to Cuba are being abused. They are not people-to-people trips. They are tourist trips that are providing hard currency for a dictatorial, tyrannical regime to get hard currency that it uses to oppress its people. And that's why these trips need to be carefully scrutinized."